Do you want to offer a unique experience to your children on their birthday? Do they love being around animals? 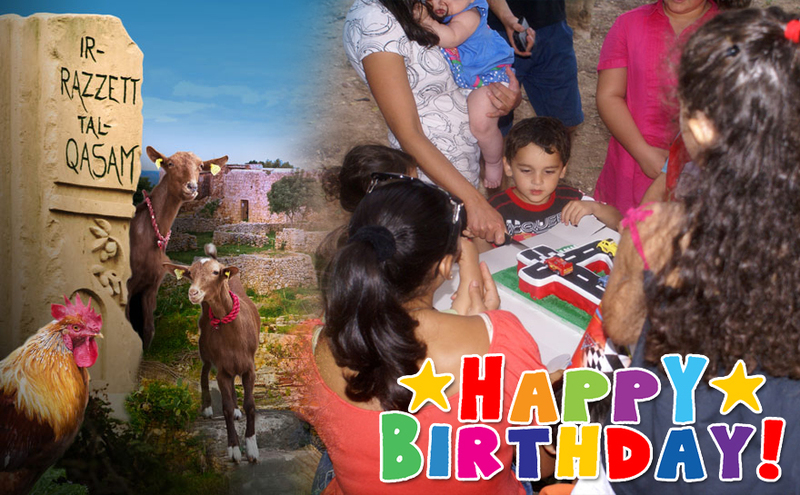 If your answer is yes to both these questions, then a birthday party at our Rural Heritage Trail is ideal. A visit to a strawberry field to see how it is cultivated. Feeding and petting of George the donkey, Betty, Molly and Rożi, the goats and Buttuna the black sheep. Seed sowing in pots for all the children to take home. Enjoy food and drink in one of our picnic areas. Children over 9 years can also visit a World War II beachpost and some Roman tombs. For bookings and more information, contact Veronica on 21581592 or 79393881.